Xoloitzcuintli is a very old Latin American dog breed, with a documented existence going back 3,000 years. Xoloitzcuintli dogs (“Xolo”) were treasured by the Toltec and Mayan people, while the Aztecs used them for medicinal purposes as well as companionship. The Aztec people believed that holding the dog could cure certain ills and eating the meat of the dog could cure others. The dogs were said to be the representatives of the god Xoloti. The Xoloitzcuintli is found in three sizes: miniature Xoloitzcuintli (10 to 15 inches), intermediate Xoloitzcuintli (15 to 20 inches), and standard Xoloitzcuintli (20 to 25 inches). The skull is broad and strong, and the muzzle is wedge-shaped. The eyes are mediumsized and almond-shaped. The ears are uncropped and large. The body is slightly longer than the dog is tall. The tail is long. The hairless Xoloitzcuintli variety should have no hair, although a little fuzz on the top of the head, feet, and tail is common. The coated Xoloitzcuintli variety has short, smooth hair. Any color is acceptable. Hairless Xolo need protection from the sun and are sensitive to cold weather. Some hairless dogs also get acne and may need specific care. The coated dogs need only weekly brushing. Adult Xoloitzcuintli dogs are calm and even tranquil. They have great bearing and look regal, but don’t let that fool you; this breed loves a good run and a chance to play. Although not highenergy dogs, they should have exercise every day. Xoloitzcuintli dogs are wary of strangers. Socialization should begin early, and the Xoloitzcuintli puppies should meet a variety of people. Undersocialized dogs may be timid. The Xoloitzcuintli dog breed is bright and intelligent and enjoys training that is structured yet upbeat and fun. The owner of a Xoloitzcuintli must be comfortable with being the center of attention. Every walk with the dog will bring the question, “What is that?” You cannot blend into a crowd with a Xoloitzcuintli! When raised with children, this dog breed is very good with them. The primary health concerns include skin problems and allergies. As with most hairless breeds, some teeth may not be present. Note: Upload only Xoloitzcuintli picture or your picture with Xoloitzcuintli below - spammer's ip may be blocked. 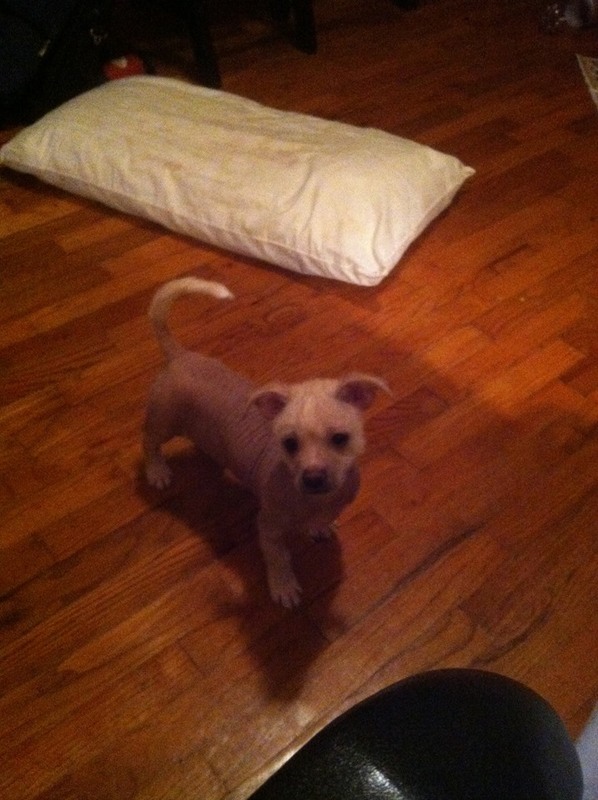 I bought Little Man as a Hairless Chinese Crested..but a man messaged me and told me it was a Mexican Hairless..What do you think?